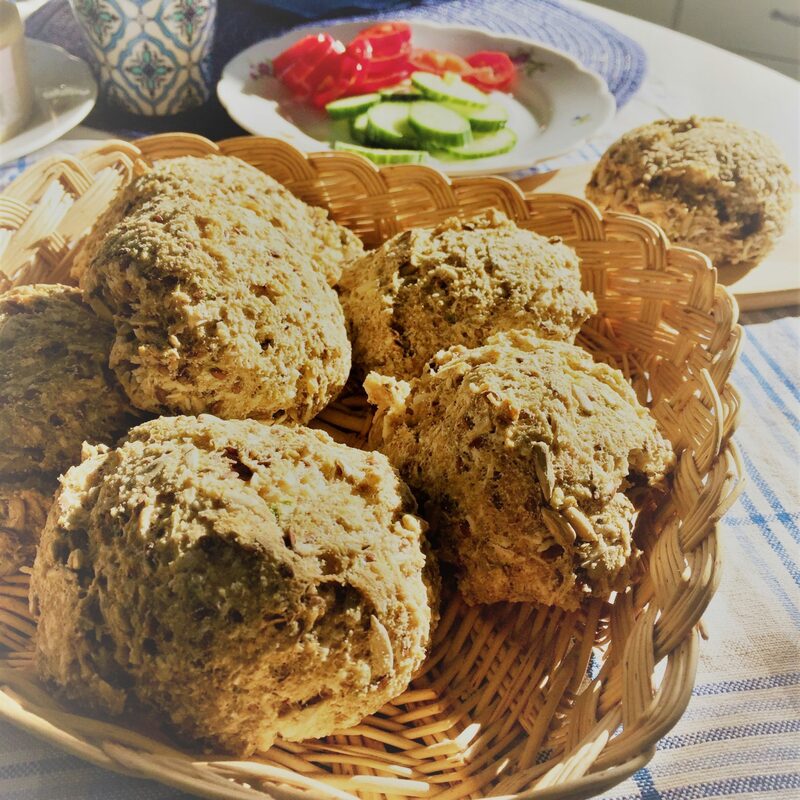 These amazing scones are such a treat for the lazy weekend brunch or a great addition to your lunch soup. Or why not indulge in the sweeter version by adding some raisins and make proper afternoon tea and scones! Sometimes we also use them to clear out the pantry as you can easily improvise and add different kinds of flour to the mix! They are of course gluten-free, dairy free and just delicious. Optional: use baking powder instead of bicarbonate of soda if you want them to rise a bit more, add raisins for sweeter touch. Preheat the oven to ca 180°C / 350°F. In a bowl, mix all the dry ingredients apart from bicarbonate of soda. Add the bicarbonate of soda to the mix and pour the apple cider vinegar on top of the soda. You will notice the magic of chemistry. Add the water, mix well and let it set for about 5-10 min. Use a spoon to scoop out buns and put them on the tray. The trick is to take a large spoonful of “dough”, put it on the tray and just carefully patting the sides into shape whilst keeping the airiness and lightness of the dough, so try not to squeeze them. If your “dough” is too sticky, try dipping the spoon in hot water before forming each bun. Bake for 25-30 min and let them cool off slightly before serving with your favorite topping. We love serving them with a fried egg or some mashed avocado on top!